For any avid coin collector, soon-to-be coin collector, or even an individual who has recently found themselves in possession of a collection of coins passed down through an inheritance, or simply lucky enough to have discovered some long-forgotten old coins stashed in a dusty box up in the attic, there is usually one key question that quickly comes to mind – what are the coins really worth? Whether it is just a few old relics that have been kicking around in the desk drawer for decades, or a decent accumulation of specimens gathered over the course of a lifetime as a part-time hobby, the natural inclination for anyone is to investigate the potential value of these hallmarks of minted memorabilia. Just as with almost any form of collectible item or memorabilia, there are numerous factors that play a part in determining both the price and the value of any particular coin. Once a single coin’s intrinsic worth has been evaluated, its relative value as part of a larger collection can be more accurately established. Initially, the novice collector needs to understand the subtle but important difference between the terms ‘price’ and ‘value. In most of the general population’s mindset, there is no real variation in exactly what these two terms actually signify, and are quite often used in identical circumstances. However, to a knowledgeable coin collector or coin dealer, they represent completely different things. In the most obvious context, the ‘price’ of a particular coin is what an interested collector would pay for that coin when it is purchased, either from a dealer, another collector, or a family member or friend. Conversely, the ‘value’ of a coin is what a dealer would decide to pay to the person offering it up for sale. While coin collecting is certainly one of the most fascinating and rewarding of hobbies, the coin ‘market’ as a whole is an extremely complex and often a very competitive industry, and as such there are going to be numerous factors and market dynamics that have a significant influence on coin prices and their corresponding values. The following coin characteristics are the primary components that play a role in determining the value and price of a single coin, or an entire collection. Undoubtedly, one of the foremost influences that determine either the value or price of a particular coin is the overall ‘supply’ of that coin in a specific grade that is currently available to the general public for purchase. This factor is impacted by the total possible quantity of coins made available to the coin market as determined by the initial mintage or production figures for that coin. In most countries of the world, once the yearly production cycle comes to an end, the coin literally ceases to exist with that year stamped on it, and are subsequently melted down or destroyed and are never used in circulation again. Therefore, the obtainable supply of that coin for that particular date is fixed or set at a given quantity, unless re-strikes are added to the total available inventory. Numerous market dynamics will influence the overall demand for a particular type or mintage date of any specific coin. Early in the 20th century, coin boards became very common, which had a significant impact on coin collecting as a popular and rapidly growing hobby in America. Furthermore, with the marketing campaigns and other promotions offered by coin dealers also greatly increased both the popular interest and the resulting demand for particular types of coins. As an early ‘marketing’ case in point, during the Depression in the 1930s, a coin dealer named B. Max Mehl announced across the country that he would pay $50 for any specimen of a 1913 Liberty Head Nickel. 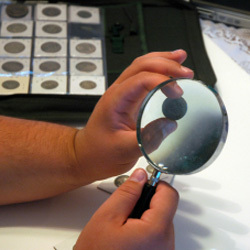 Consequently, many new hobbyists began collecting coins while they were hunting for this prized coin. In a more recent coin campaign, the 50 State Quarters Series promoted by the United States Mint created an entirely new generation of avid coin collectors, of all ages. Likewise, in 2009, the re-designed Lincoln penny brought even more enthusiasts into coin collecting once again. As far as having a major influence on the coin market, each of these factors played a role in increasing the general demand for coins and collecting, and causing an increase in prices and values as a whole. Naturally, regardless of its mintage, when a coin is composed of a precious metal like gold or silver, the fundamental value of the metal within the coin is an important factor influencing its value and price. Back in 1965, the U.S. Mint started substituting the composition of the dime, nickel, and half dollar from 90% silver with a base metal that was an amalgam of both copper and nickel. Consequently, U.S. coins produced up to 1964 are valued more for their silver content than their intrinsic worth to a collector. As a result, as the price of gold and silver rises and falls on the precious metals market throughout the world, the prices and values of gold and silver coins will mirror those market fluctuations for the very same reason. Needless to say, no matter whether they are a novice or experienced numismatist, coin collectors of any stripe certainly prefer their coins to be of the finest condition possible, which means in the ‘uncirculated’ variety. Getting one’s hands on coins that as appear as though they just came from the mint, they had to have been taken out of circulation and safely stored since their production year. In the 19th century, collecting coins was a rare practice in the United States, which made any uncirculated specimens equally uncommon and very costly. On the other hand, during the 1930s and 1950s the growing enthusiasm with coin collecting across the country caused many new hobbyists to hang on to their mint-state coins. As an illustration, the 1931-S Lincoln penny not only has a very low mintage, but an uncirculated specimen is not valued for too much more than a circulated coin. The reason is because many collectors during that period began hoarding uncirculated rolls of these coins due to the mintage being so low. Conversely, when there is a high quantity of circulated coins and very few uncirculated, the circulated specimens will be relatively cheap, and the uncirculated will be more valuable. This value or price characteristic is also referred to as grade or condition rarities. Last but certainly not least, the ‘market’ value and price of a coin can be affected by the amount of inventory an individual coin dealer happens to have available at the time of the offer. It illustrates the fundamental laws of supply and demand once again. If a certain dealer has an abundance of 1931-S uncirculated Lincoln pennies in his or her inventory, there is a good chance the price will be lowered in order to offer more of them to collectors at less cost to decrease the available inventory. Likewise, if anyone is offering to sell a 1931-S uncirculated Lincoln penny to the same dealer, the offered value will more than likely be lower than expected due to the high quantity of that particular coin in the inventory. In other words, the more coins in the inventory, the lower the value. Therefore, it is a very wise idea for a potential coin seller to get a few quotes from different coin dealers before the sale becomes final. Whether it is a single coin, or an entire collection, in order to gain the most information regarding just how valuable the coin will be to the coin market in general, or to any other collector or dealer specifically, there are a few very important resources to investigate beforehand. One great resource is The Official Red Book, now in its 66th year, and is considered the premiere resource for U.S. coin collectors. This best-selling “one-volume library” helps any collector make smart buying and selling decisions. It contains full-color photographs, detailed technical data, and up-to-date mintage information and statistics. Another must-have resource is The Official Whitman Blue Book, HandBook of United States Coins. This extremely valuable publication has been the standard wholesale price guide for coin collectors for over 50 years. Every edition contains vital information on grading and collecting guidelines, comprehensive mintage records, significant historical information, and the latest average dealer buying prices for all U. S. coins dating back from 1616 to the present. It is fully illustrated with real-size color pictures and is revised annually.